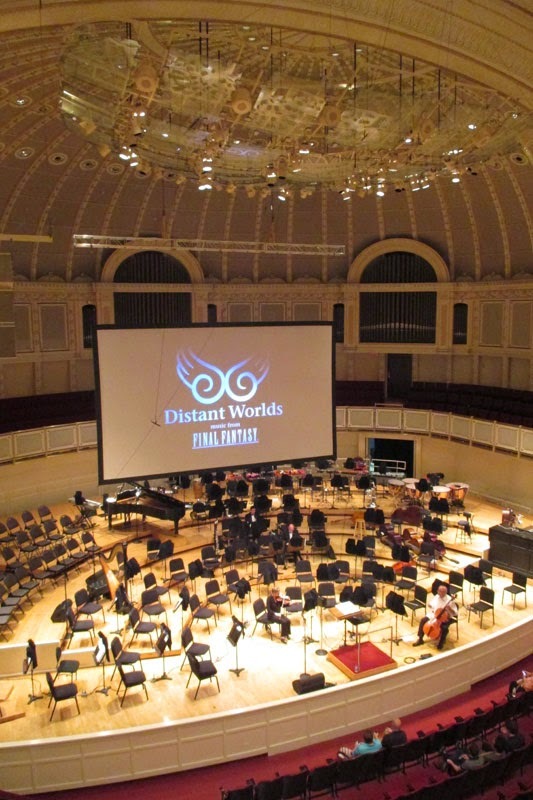 The latest adventure I went on was "DISTANT WORLDS" a Final Fantasy Symphony Concert that was being held in Downtown Chicago. To educate those who may not know exactly what's going on here, Distant Worlds is the second incarnation of a series of Symphony Music events held... well EVERYWHERE across the world. They travel from country to country, state to state, and get orchestras to play pretty versions of Final Fantasy Videogame Music. This year, they are doing a 20th Anniversary Tribute to the game Final Fantasy 6, which is quite possibly my favorite Final Fantasy Ever. I loved the world, I loved the characters, and while it wasn't a perfect game by any means (let's not talk about that second half open ended stuff) it had REALLY memorable tunes. Our view from where we were sitting. We had some pretty nice seats! And yes. Those ARE pipe organs in the back. 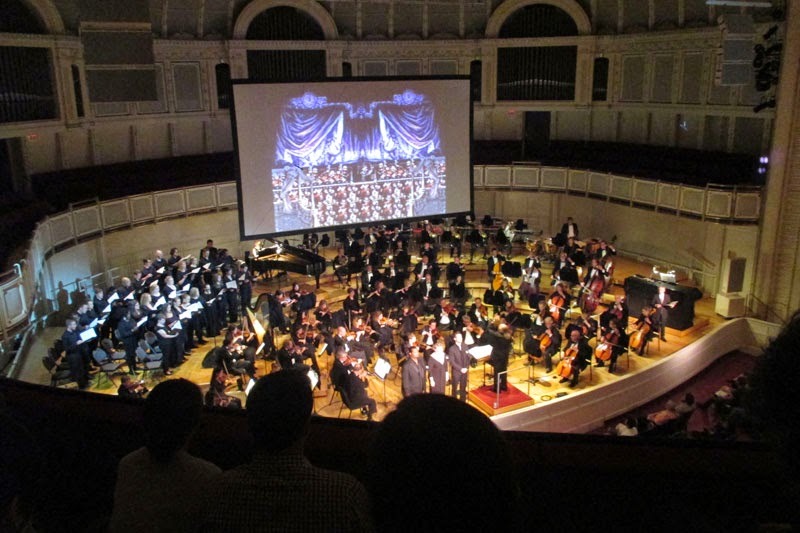 The first half of the show had songs from other games, some I've heard at symphony before, others new! They even fooled us by playing One-Winged Angel like, the THIRD song in, and then teased the audience by telling us "Now you guys will be wondering WHAT we'll play for the encore THIS time!" (It's very common for that song to be used as Encores at video game concerts). They played smatterings from all different numbered games, one of my favorite being the new Chocobo Mix, and really I was just squeeing from seeing the baby chocobos from XI on the screen while cute chocobo music played. And yes, I did participate when they encouraged the audience to during the song. :) I love my fluffy yellow birds! Intermission came and went (I went perusing the area, which I'll explain why in a minute), and then came the Final Fantasy VI part of the show. They allotted pretty much the entire second half to VI music, which I couldn't be happier. Many smiles abounded! 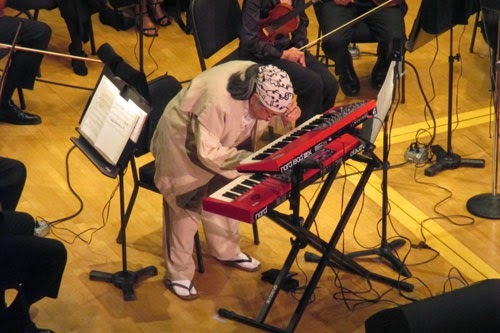 Nobuo Uematsu himself was there, he played for us! Remember that pipe organ I mentioned in that caption up there? Yeah. Sooooo they played Dancing Mad (The final boss medley from FFVI) and they played ALL FOUR PARTS. Yes, that even included my favorite Third Part which is composed entirely of pipe organs. While I've only listened to it on CDs or in the original music form, hearing it out of an honest-to-goodness pipe organ was such a joy. Seriously, they pumped up that performance to 11. The pipe organist was so into it and the song was so powerful it was making the whole room shake with awesome. AWESOME PIPE ORGANS THAT IS! (I did see the screen shaking, it was pretty great). ...Did I mention I love pipe organ music? No? WELL I DO. And of course, if we're doing a Final Fantasy VI tribute, we can't possibly leave out the OPERA sequence! OF COURSE we'd show a picture of the orchestra at the orchestra. They did a whole new version, complete with narrator, and new singing parts during the duel. Honestly, all they really need to do know is make the ACTUAL opera and we'll have hit completion. Rest of the songs were awesome, until they faked me (and Kristy) out with the last song. We had been on such a VI kick, they said "oh hey, here's the main theme" and we were all "okay... terra's theme again? Sure?" and then "BAM" they hit me with the Bridge Theme from all the games, and I kinda lost it there because it's my most favorite song ever. Encore was a battle theme medley which was delightful! We all clapped a lot and then headed home. WHEW. I was staying a hotel on the other side of the city, and I think I messed up my back on the bed, so I'm kinda hobblin' around today, so I wrote you this write up. :) Overall, it was a great experience. BUT MY STORY DOES NOT END HERE! 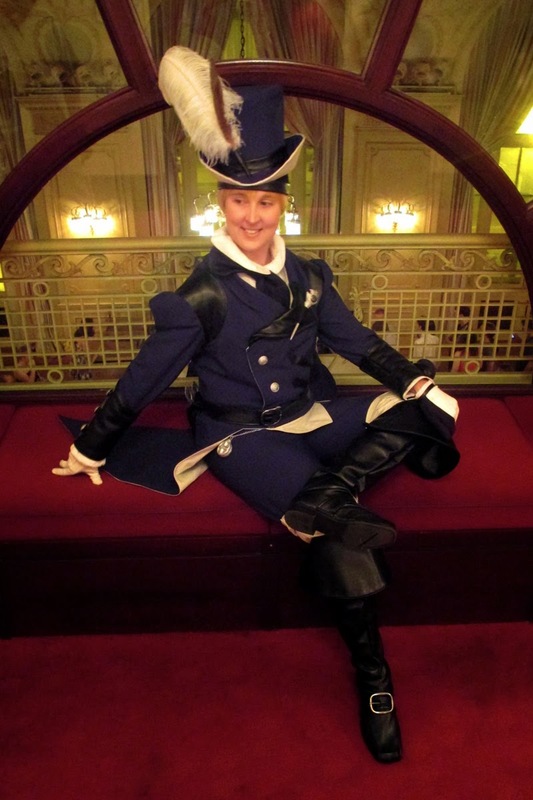 I had been to a couple of Distant Worlds/Dear Friends concerts over the years and I always saw people there in costume. 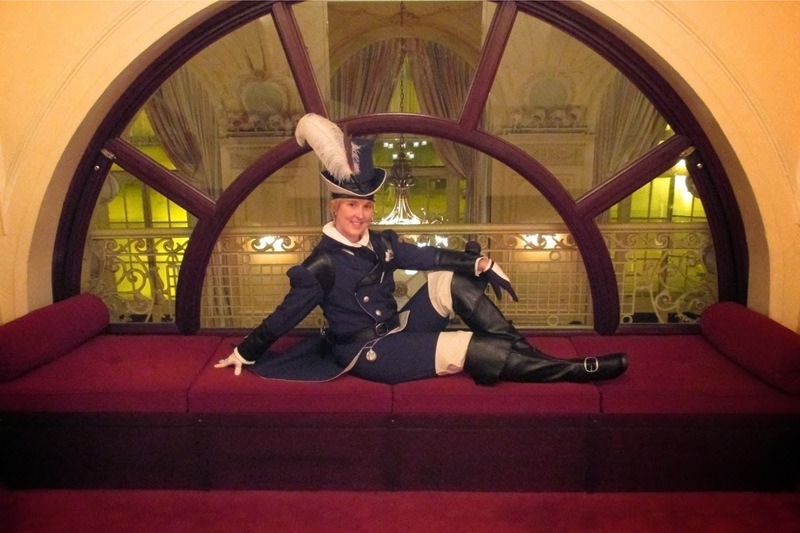 I had wanted to go, but I never got the guts and/or a good costume I felt comfortable wearing in a beautiful orchestra hall. UNTIL NOW. That's right, I brought Weaver. I was honestly freaking out about it the entire time until I got there, because "what if i'm the only one in costume omg". Kristy demanded to make sure I wear it or else be ridiculed forever, and my husband was all OMG JUST WEAR IT YOU'LL HAVE FUN. So I put it on, and strutted downtown in it. I got a lot of compliments on my hat(s) from random passerbys. I found the GREAT chair when waiting for friends at their hotel. Honestly, I was simply pleased people knew what I WAS! 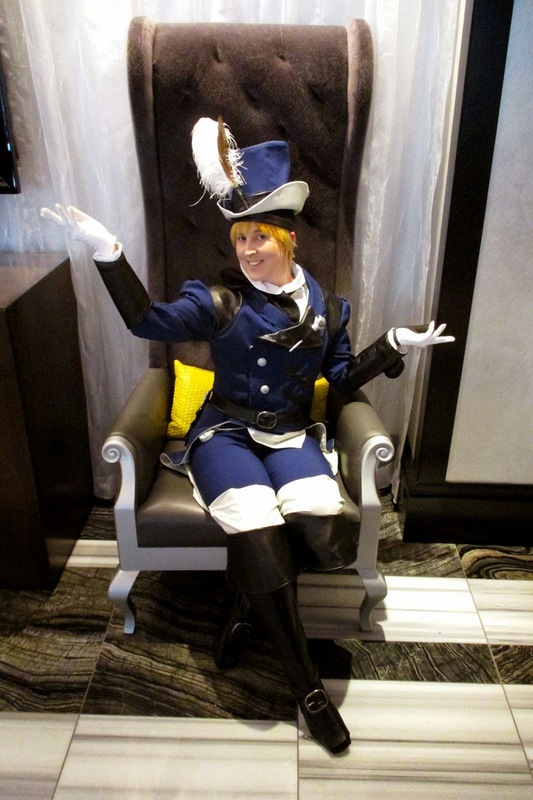 I was a faceless character in Job Gear from an MMO, and it was a hoot. I was doing emotes and even Manderville danced for a few people throughout the night. Many laughs were had! Who WOULDN'T pose like this on this couch? I knew some other pals who would be there, so decided to hop on outside into the hallways during the intermission, to which I found there were a ton of people. I couldn't find my pals (and my cellphone was dead from the drive in that I had to navigate with it), so I was bummed about that. I'll have to try to catch them at the next event! Meanwhile, the architecture inside the hall was absolutely PERFECT, I just wish my camera had better settings for indoors/nighttime that I could figure out, but I've posted some of the better pics we got on this post! End of the night took a while, as we were all meandering around the lobby area. I got stuck for some more pictures, but I'm always one to oblige when I can. I met some lovely other cosplayers out in the sidewalk area, and I even had a guy with a fancy camera and a light wand my picture. So I'm sending a call out - if anybody catches pictures of me from that night let me know! I'd love to see them! OVERALL: Good times, awesome night with a hilarious outfit, great crowds, and a fantastic show! Will do again, 10/10. You can catch more pics of the outfit on the facebook page: http://www.facebook.com/KarmadaCosplay!